CRIME: Controlled entrapment against corruption? The Czech government wants to use a new weapon in the battle against burgeoning corruption. This involves so-called integrity tests, which rely on the introduction of undercover provocateurs, who would check the reliability of workers in selected professions, such as customs officials, policemen, and financial officials. The proposal’s creator, interior minister Stanislav Gross, was inspired by Great Britain, which has been using such tests for a number of years. The Czech interior ministry regularly has consultations on corruption with its British counterparts, because, as Michal Mázl, a department director with the Czech interior ministry, says, the reality and legislation in Great Britain bear similarities to our conditions. “It is my opinion that undercover provocateurs should be handled very carefully. Such entrapment should always be based on a specific situation, conditions, and rules, if it is to be used,” notes Mázl. In terms of competitiveness, the Czech Republic improved last year in all four basic criteria that are tracked (something no other compared central or eastern Europe country managed), rising six notches to 29th place. This follows from the results of an analysis by the Swiss IMD institute, which compiled a rating system for 49 countries under which over 300 partial criteria were examined. 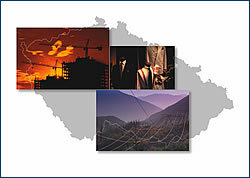 The four basic monitored criteria are: economic output (GDP, international trade, investments, employment, and prices); the effectiveness of national and governmental activities (public finance, fiscal policy, legislation, education, monetary policy, business conditions); the efficiency of companies (productivity, labor market, management, financial market), and infrastructure level (technological, social, science and research, health care, and environment). The Czech Republic achieved its best result in the economic output category, and the business sector recorded the most dynamic development. During the past year our country was 55% as competitive as the US, which has long been the leader. According to a proposal by the Ministry for Regional Development that was recently approved by the Czech Government, for the first time the state will begin supporting the purchase of older apartments and houses. From September this year, individuals who buy an older house can receive a state subsidy towards their mortgage interest. The level of this subsidy will be set between 1% and 4%, depending on the level of interest rates during the year (this year’s level is 3%). The subsidized mortgages will be available to people under 36 years of age who do not own any other real estate property. The proposal does not apply only to “antique” structures – it further suggests that flats and houses no more than two years old should be included. However, the subsidized portion of the mortgage will be limited to CZK 800,000 for apartments and CZK 1.5 million for houses, and will apply for only ten years.